The former president's megaphone speech happened just hours after a controversial West Roxbury visit. 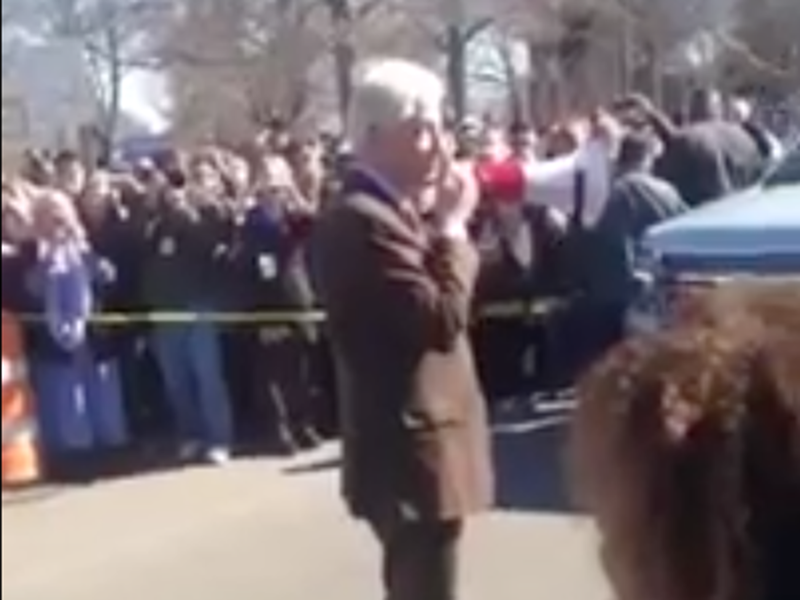 By Kyle Scott Clauss·	 3/1/2016, 6:04 p.m.
Former President Bill Clinton’s public appearances this Super Tuesday have some crying foul over potential violations of Massachusetts election law. Hours after he went inside polling locations in Newton and West Roxbury and was photographed posing with Boston Mayor Marty Walsh and a Democratic ballot, Clinton visited a polling place in New Bedford and was filmed nearby stumping for Hillary Clinton with a megaphone-wielding Mayor Jon Mitchell. “I especially thank those of you who are supporting Hillary, but we ought to give the others a round of applause too,” Clinton said. He spoke for nearly three minutes. Paul Feeney, Massachusetts state director for the Sen. Bernie Sanders campaign, says he received 12 calls in half an hour from voters who said the polling place was blocked by Clinton’s appearance. “Folks were calling the hotline saying they wanted to vote but couldn’t,” he says.